The church consists of the chancel, nave, west tower, and south porch. There was once a transeptal chapel entered from the south-east corner of the nave, having a greater projection than the adjoining porch. Traces of the junction of its roof to the nave wall can be seen outside. The main part of the chancel and the nave seem to be of the 13th Century, the latter being largely reconstructed in the 15th Century. The porch was added in the 14th Century and the tower in the 15th. 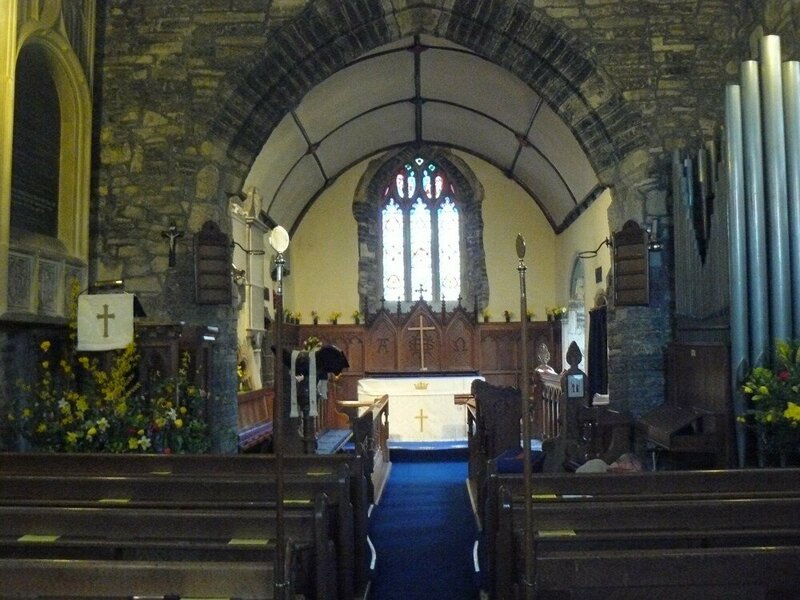 Of the church as it now is, there remains of the 13th Century, the two south windows of the chancel, the lower parts of the responds of the chancel arch, and the lower part of the nave walls. Of the 14th Century, the outer doorway of the porch, and the arched recess in the north wall of the nave, opposite the one which once held an image. The east window and the windows in the north wall of the nave are 15th Century, as is the inner door of the porch with the niche above, and the tower. The south wall of the nave was almost completely rebuilt at some later date. There can still be seen traces of the arched entrance to the transeptal chapel, and to the west of the porch, the splay of a large window, probably of the 13th Century, and the head of an early door above the present one. The upper part of the chancel arch and the roofs of the nave and chancel are 15th Century. The moulded wall plates, the ribs and the bosses of the wagon roofs are partly original but largely restored. The 15th Century tower is of three storeys with a staircase turret, and is of the same period throughout, though there are differences in the window traceries. In the chancel on the north side, there is a 14th Century arched recess which may have been an Easter sepulchre, and a curious rectangular window partly blocked. The rood loft staircase which projected in a turret from the north-east corner of the nave, has been pulled down and replaced by a buttress, though the blocked up door leading to it remains partly hidden by a wall memorial stone. 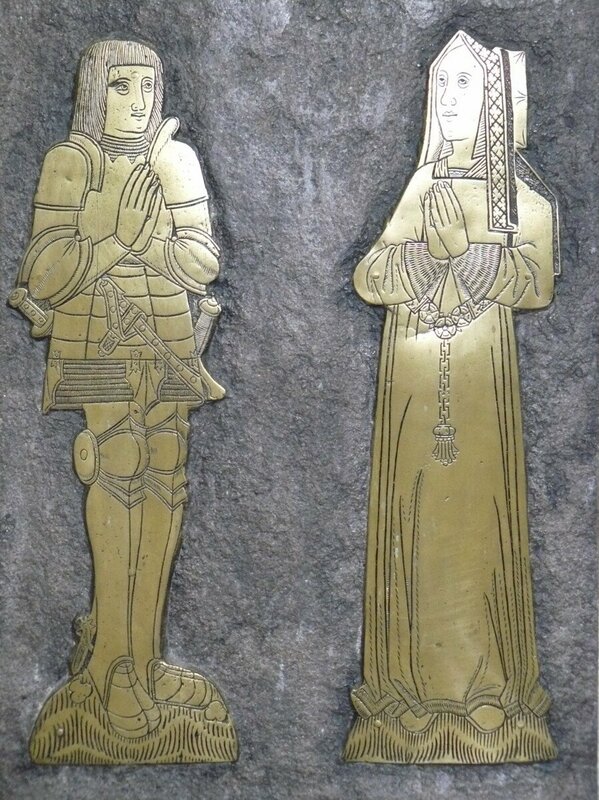 In the middle of the chancel is a fine brass, on which are the effigies of John Brent, who died in 1524, and Maud Pauncefoot, his wife, with three shields and an inscription. 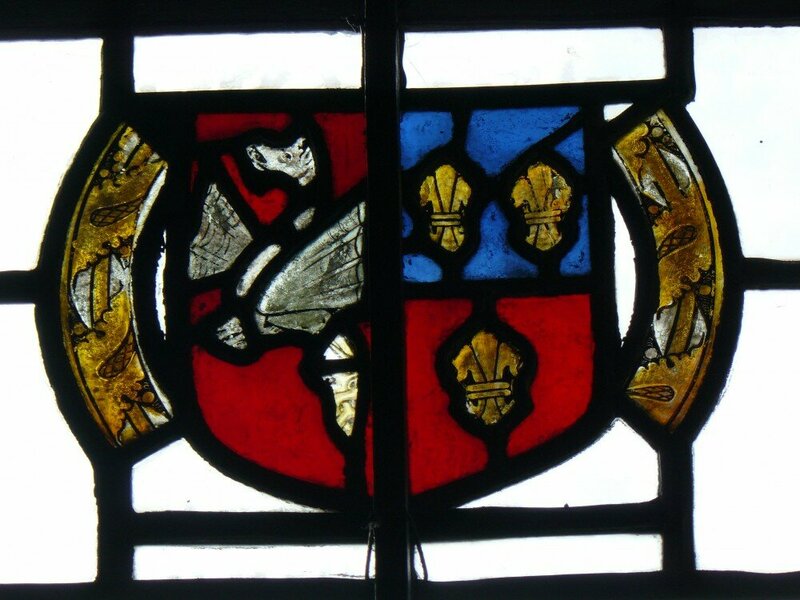 In the window to the west of the porch, on the south wall is stained glass of the early 16th Century:- a shield of the same John Brent showing gules a wyvern argent for Brent, impaling a per fess azure and gules three fleur-de-lys for Pauncefoot. Of the other stained glass, perhaps the least said, the better. Over the porch door is a wall memorial stone to the memory of the last of the Brents – the lords of the manor from the 13th to the end of the 17th Century. The John Brent commemorated is not buried in the church. He was a Roman Catholic. The stone was erected by his wife, who was a Protestant. She left a sum of money to found the “Brent charity”, which still provides a small sum annually to be distributed to the poor of the village. Worthy of notice are the memorial stone on the north wall of the chancel to the memory of Sarah Giles, and two inscribed stones on the outside of the south wall of the chancel. They are excellent examples of local rustic craftsmanship. In the 19th Century, the church suffered two restorations. In 1834, the tile roof was replaced by slates, and the plaster which then covered the walls, both inside and out, was stripped. This was a typical piece of 19th Century restoration, such as led to the “anti-scrape” agitation of William Morris and his friends. It is particularly regrettable in Cossington, as the church is built of soft blue lias stone, which does not stand up to years of weathering. The usual practice in the neighbourhood is to protect buildings of this stone with a rendering of plaster. In 1900, there was an even more unfortunate restoration. The western gallery – the “singing gallery” of the old churchwarden’s accounts was removed, together with the three decker pulpit and the old box pews. To make up for the loss of seats, the central aisle was contracted, so that now it is impossible for an averaged sized bride and groom to walk from the altar rails to the vestry side by side. 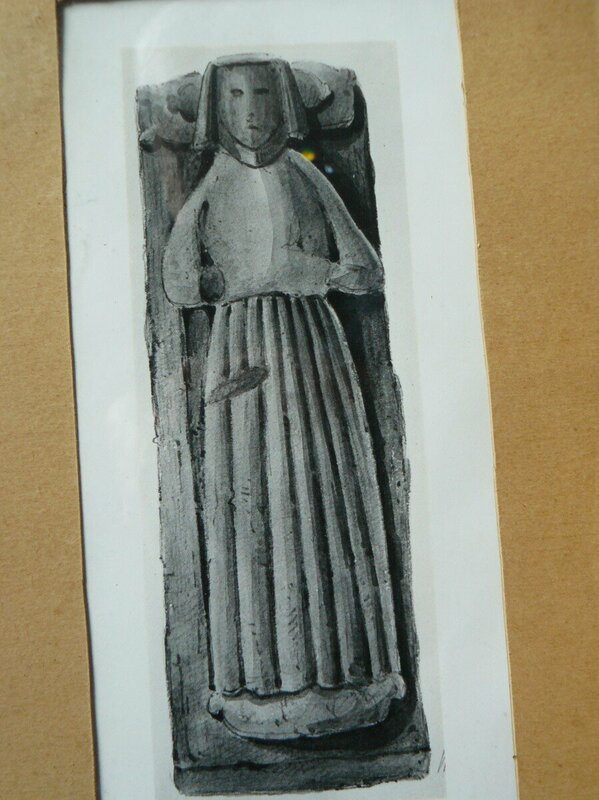 The most disgraceful part of the restoration was the removal from the chancel (to perish outside the porch) of an early 14th Century recumbent figure of a lady, believed to be Claricia de Ford, the wife of one of the lords of the manor. No faculty was obtained for the removal and there is no record in the parish of her existence. What is left of her is under the grass mound on the east side of the porch. A copy of a mid-nineteenth century painting of her can be seen by the porch door, where there is also a photograph of the church as it was before 1900. Though the church as a building cannot claim to be of great beauty or architectural interest, the church, the body of Christians, here in Cossington, has an unbroken history going back to the earliest days of Glastonbury. Cossington was one of the Abbey manors, and one of the earliest churches, Christian long before Wells or Canterbury. When the Saxons came here they were already Christians, and there has been no break. Weight: 4 cwt. – 2qrs – 2 lbs. Weight: 4 cwt. – 2 qrs – 21 lbs. Weight: 5 cwt. -1 qr – 26 lbs. Weight: 7 cwt. -2 qrs – 4 lbs. Weight: 11 cwt. – 2 qrs – 4 lbs. Effigies of John Brent Esq. Lord of the Manor of Cossington 1524 in armour, and wife Maud daughter and heir of Sir William Pansfoot (Pansforte) Knight (date not filled in) with four ? shields one lost? and marginal inscription mutilated. On the floor of the choir, the lower part re-laid. The figures are turned towards each other. John Brent is represented as clean shaven and bare headed. His long hair reaching to the shoulders is cut straight across the forehead. His hands are bare. His armour consists of a collar, or standard of mail with vandyked lower edge, breastplate, shoulder pieces with upright guards that on the left considerably the larger and higher, large elliptical elbow pieces similar to those worn by Thomas Golde 1525 (Crewkerne Church). John Brent wears a skirt of five lames with curved edges, from which hang at wide intervals three tassels over the skirt of mail. The sword hangs diagonally behind the legs from a leathern belt slanting from the right hip, while the hilt of a dagger appears beneath the right elbow. The knee cops have plates above and below the large circular plates at the side. On the feet are worn broad-toed sabatons, to which rowel spurs are screwed. The feet rest upon a mound of grass with two trefoils. Maud Brent wears the kennel headdress with lappets ornamented with a lozengy pattern of quatre-foils in front, under which an unusual lappet appears against the cheek. She wears a closely fitted gown, cut low and square at the neck with chevron- patterned edging, with ample skirt edged with fur, the full sleeves with deep turned back cuffs edged with fur. Round the waist a loose girdle is clasped by three roses, from which hang a chain with oblong links, from which is pendent a pomander box shaped like a columbine flower. Her feet rest on a mound of grass. the nave. On the sinister side above the lady a second shield bears Brent, impaling party per fess (a2 and gu) three fleur-de-lys 2 and 1 (or) Pansfote). The disposition of the lower shields, and whether there was ever more than the one remaining is uncertain. 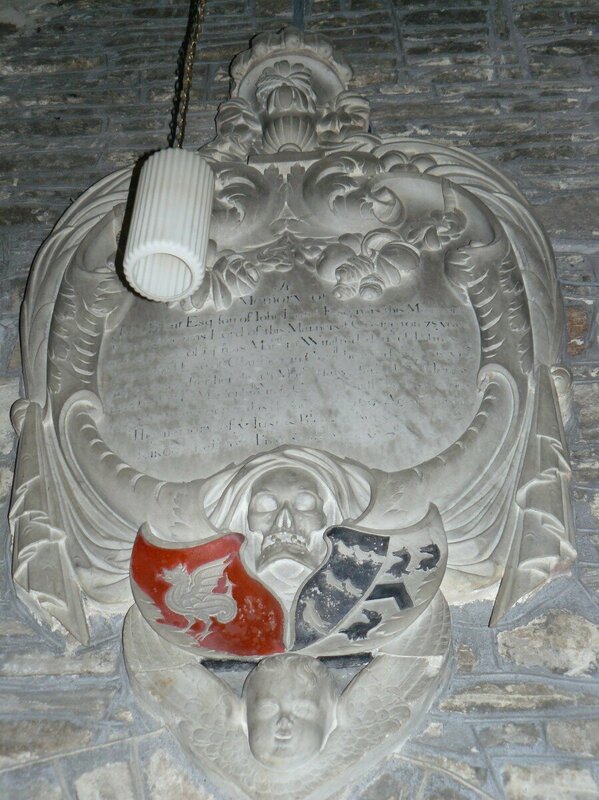 The stone was cut down many years ago, and this shield and parts of the inscription remained in the church chest until recently, when they have been laid conjecturally in a new stone. It seems probable that the sinister shield, if there was one bore Brent only, and that the shield still extant was on the dexter side. It bears Brent impaling (a2) 3 escallops (or) Malet. The whole is surrounded by a marginal inscription, measuring 1⅝ across, and is in black letters. Of the original stone which lies on the floor of the choir about 50 ins remains, the rest has been made up in recent years. John Brent was the son of Robert Brent and his wife Margaret daughter of Sir Hugh Malet of Currypool. Collinson tells of another brass perhaps. 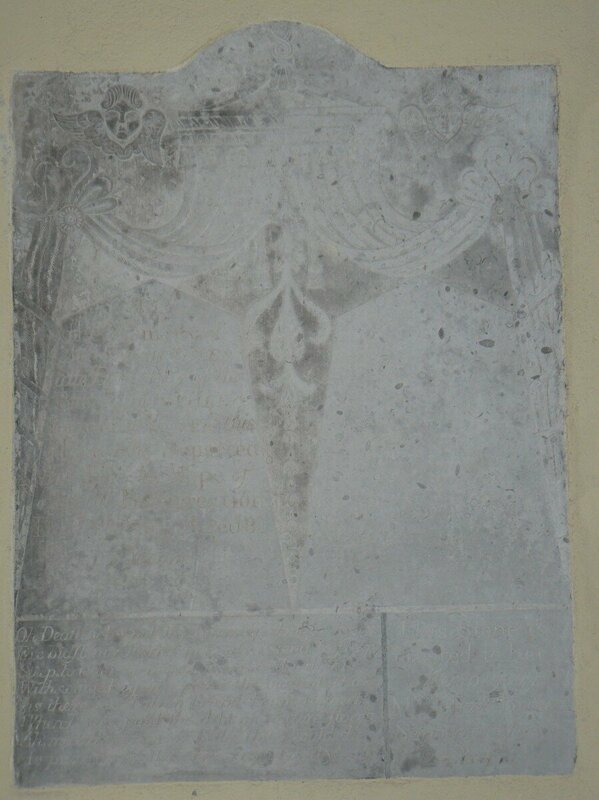 The inscription is on the north wall to the memory of John son of John Brent esq who died Jan 24 1691 aged 80 years. This John Brent seems to have been the son of John Brent ob 1628, and Winifred daughter of Sir John Arundel or his second wife Mary, daughter of Sir Henry Ludlow. The will of John Brent dated Aug 10 1524 states “To be buried in the chancel of the Church of Our Lady at Cosynton to bye a tenor bell performed to be rong with all £20”. All the above text transcribed from original by Mr R.M.Williams by Liz Turner 2012. The plate includes a cup and cover of 1573 by “I.P.” and a cup and paten of 1704. A rector of Cossington was mentioned in 1225. The living was sole Benefice until 1976 when it was linked with Woolavington. 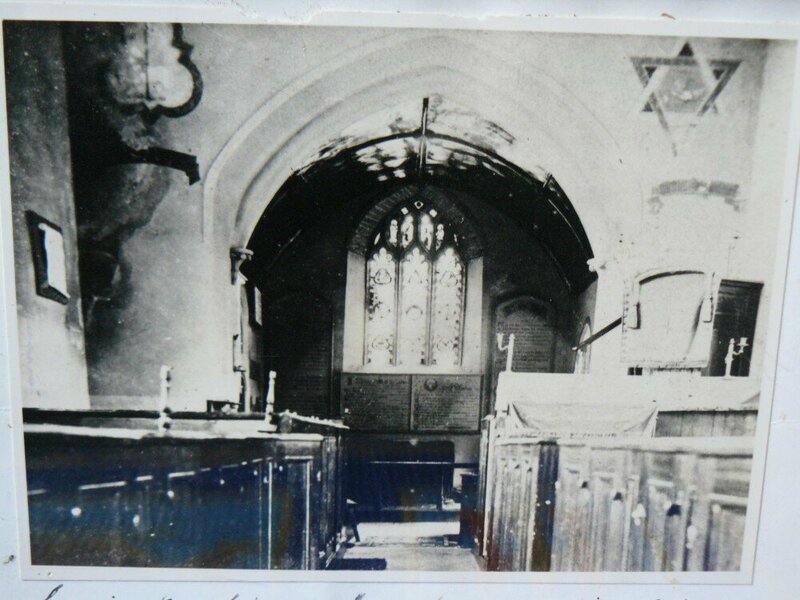 In 1987 it became part of a single benefice with Woolavington and Bawdrip. 1514 Aug 13 Joh. Pockswell A.M.
1528 Feb 28 Will Huyde A.M.
1597 May 28 Joh. Grene A.B. 1604 Oct 27 Hugo Ball A.B. 1742 Feb 28 Joh. Cucker B.L. 1756 Jan 9 John Jennings B.A. 1758 Feb 25 Charles Reeks M.A. 1834 Jan 2 John Valentine B.A. 1866 July 27 William Pope M.A. 1897 Sept 9 Robert Augustus May M.A. 1908 Oct 10 Alfred Henry Price B.A. 1911 Jan 26 Mark Leonard Chorp M.A. 1957 July 4 George Trevor Vodden B.A. 1974 Feb 7 Frank Hayman Stevens M.A. 1976 Feb 16 Raymond Michael Barnett B.A. 2006 Jan 30 William Henry Howard Lane B.A. *Denotes Monumental Inscription in the Chancel. Information obtained from chart in church porch. A History of the County of Somerset Vol 8.